1. Withstand the Boston winter - complete with icy temperatures, wind, and snow. 2. Be as easy to put on and take off as possible. 3. Be something that travels with the child should their teachers take them on an outing. Having now done this for 3 years, we have some recommendations. 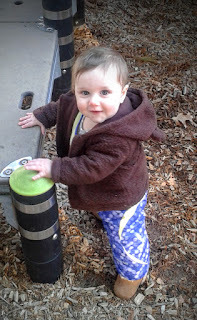 We've already covered high performance boots and socks for toddlers in another post. For coats we've really liked having the Columbia Sets for Toddlers . We've always gotten the coats that came with the firefighter style pants. These keep the legs warm while staying safety in place with Velcro shoulders, whether the kid is going down the slide or doing the "ants in the pants" dance on the train. The Velcro also allows you to adjust the length of the pants should your tyke have a growth spurt in the middle of winter (these are very generously sized outfits). Additionally, having the pants be separate from the coat (as opposed to something like the Columbia Toddler Dude Suit ) makes it possible to have an outfit for an intermediate temperature by being paired with a lighter jacket (pictured). In all, this is a highly practical way to allow toddlers to be outside, come what may. If you're expecting that you'll have a baby who is unlikely to walk before the end of winter, then something that's basically a bag for the baby is the way to go. 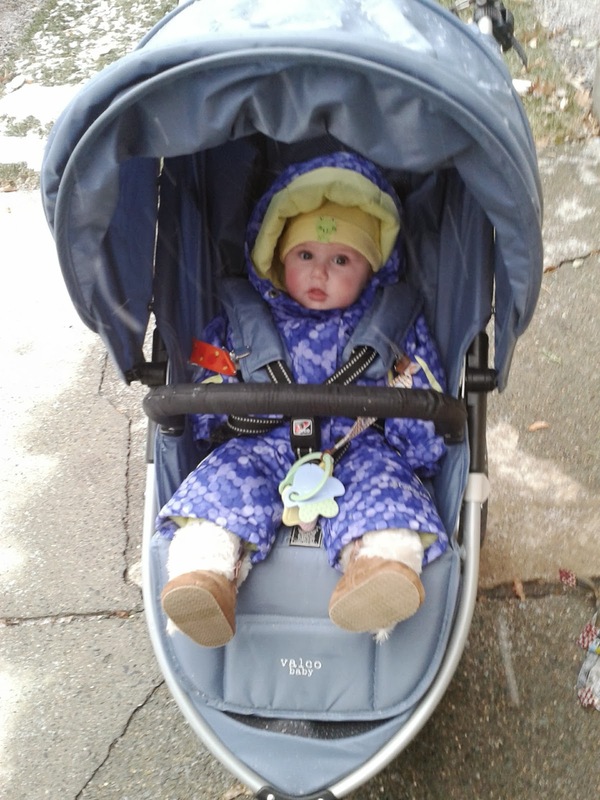 As we mentioned in our post about the versatile winter blanket, we do not have stroller bunting for our kids. This is because we need their cold weather gear to go with them and be usable for day care outings, without having to unstrap it from the stroller. With our first, who was born in June, and thus 6-9 months old in her first winter, we made the mistake of getting her the Columbia Sets for Toddlers described above. This set, while really great for older kids, was kind of a pain to wrestle a baby into. Not only did we have to stuff her into both parts of the snow suit separately, but we then had to get some boots on her feet as well. So, when planning for my son's arrival, I wanted something easier, especially since I knew I would have to get two kids bundled for any outing. We settled on the 7AM Enfant Doudoune One Piece Infant Snowsuit. This brand makes all kinds of high quality weather gear from stroller bunting, to carseat covers, to carrier covers. However, the snowsuit, in my opinion, is the best investment because it is one thing that can be used in any of those situations. The suit is essentially a bag with a hood. Unlike a true bag, though, the legs are separate and closed with snaps like a footie. This means that the baby can both straddle the parent in a carrier as well as be easily strapped into a stroller. Additionally, no separate mittens are necessary as the sleeves can be made to leave the hands covered or uncovered, as desired. It definitely wins points for ease all around. Just this week, a fellow parent in the day care infant room complimented the ease with which I was able to remove the outerwear from the baby while juggling all of his other possessions. Best of all, a baby wearing this suit can be placed into a car seat safely. You've doubtless seen the recommendations against strapping children in puffy coats into car seats because they can easily slip out in accident. However with this snow suit you can put the straps of the car seat inside the coat (thread the crotch strap between the leg snaps and attach to the shoulder straps before zipping up the sides). This allows you to get away with not having a separate car seat cover, which for a carfree family is nice bonus. As we mentioned in our post about gender neutral clothing, we tend to buy seasonal gear at the end of the previous year's season. We lucked out and were able to get the baby snow suit for half the price last spring. Likewise, by shopping for toddler winter coats in the summer and/or at second-hand stores, we've never paid full price for those either. Since staying warm is one place where skimping on quality is a bad idea, it's always nice to get a good price on something you were going to buy anyway. Buying high quality clothes second hand, whether at your local thrift shop, or from ThredUp, is always a good idea. Children grow way too fast to wear out anything well made.